The Los Angeles Rams have already done a bulk of their work in free agency this offseason, bolstering their defense by adding veterans Eric Weddle and Clay Matthews, and completing their offense by re-signing Malcolm Brown and Andrew Whitworth and bringing in Blake Bortles. There are still additions to be made, but most of those will likely come via the NFL Draft later this month. With the departure of Mark Barron, linebacker is one area of need for Los Angeles. Former University of Washington safety Taylor Rapp does not play linebacker, but the projected first-round pick could help add to an already solid secondary for the Rams. 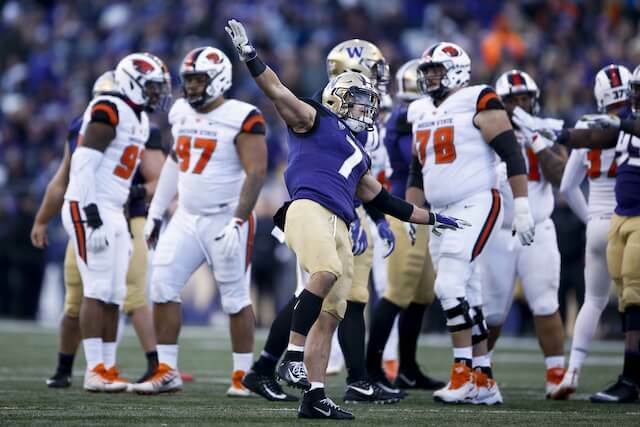 Top Safety prospect Taylor Rapp of the University of Washington continues to make the rounds, with scheduled visits upcoming to the #LARams #Giants & #Panthers, per source informed. In three seasons at Washington, Rapp did not miss a single game. He recorded 168 total tackles to go along with seven interceptions, six passes defended, two forced fumbles and six sacks. The Rams hold the 31st pick in the first round, so it is unclear if Rapp will even be available to them when it is their turn to make a selection. If he is though, the Rams may not hesitate to add him to a secondary that includes Weddle, John Johnson, Aqib Talib, Marcus Peters and Nickell Robey-Coleman.